A look up at the blue of the sky any day on our planet will fill most people with a sense of reassurance and warmth. Yes the clouds roll in and the storms will come. The idyll can change in seconds into a seething mass of dark threat in a moment that can sweep away towns and lives in a relatively few moments. Discs, cylinders, triangles and orbs of light, some as large as cities, dangle and dance hither and thither moving at thousands of miles an hour, pouring questions out in the mind's eye of human witness. There are records of thousands of them now over the millennia written on walls of stone and pieces of papyrus, paper, plaster, celluloid, magnetic tape and metallic discs. They have been out there to see by intention and by accident with no-one in final authority to explain them, or to define their veracity. The trouble with solving the enigma of the UFO 'phenomenon' is that in consensus it tends to be seen on the level of the tooth fairy and the hobbit and thus defies the terms of any serious mental uptake for human recognizance. That one fact is of bigger significance than anything else. Unfortunately a look at blogs discussing UFO verity on the Internet will soon make it plain that the world is full of more crackpots and mental defectives than it ought to be, certainly more than the subject deserves. Could conquering aliens be any more cruel to humankind than humankind has been to its own? Under the aegis of the Second Law of Thermodynamics - or 'entropy' that makes sure everything atomic breaks down, rots into greater and greater states of chaos and randomness with time, and never, but never, goes the other way - it is natural to think this way. Nevertheless, in a universe where entropy holds sway with its vagaries and destructive power, the accidents and the chaotic disbursement that it provides has, I believe, incidentally revealed the presence of such entities here on Earth from time to time without a shadow of a doubt, to all but the most intransigent skeptical minds. If Grey alien entities exist in terms of our physical reality, who or what are they and how did they come to be here? Most importantly why are they here? To get these answers from entities who are quite clearly hiding from us and quite plainly don't want to be discovered, is not possible and so one has to look at what they actually do to us for clues that might give us answers to the questions I pose. Apart from moving across our skies at phenomenal speeds in various shaped craft, at far greater speeds than us locals can manage, they abduct and perform the most heinous surgical procedures on humanity and some animal species in a deeply covert guise. These procedures mostly centre on reproductive features and capacities. They are, and have been, farming us for millennia and are covertly genetically changing us to suit their purposes. To understand those purposes we must first look into both our origins and theirs. There is evidence to suggest that devolution rather than evolution may well be the overall direction for living species. Where did that blueprint come from in the first place? All the myriad changing environmental factors and chance mutations - which allowed survival within changed environments and thus evolution through the survival of the fittest - had not yet occurred at that point. Where did the most basic of living organisms, or indeed the chemical soup that produced them in the first place, get this genetic blueprint? Therein lays evidence of states of prior order devolving into states of lesser order. The laws of physics that came with it all provide the scope for giant contradictions. you, me, the Greys and Uncle Tom Cobley and all are being systematically taken apart by a law called the Second Law of Thermodynamics in an increasing and accelerating separation of the parts of the universe in a melee of chaotic and random disbursement with time. The universe is breaking down order and the capacity that exists in it for self motivated realization, reason and refurbishment. Imagine two basic opposed existential poles between which all things that exist are arrayed. These poles define absolutes. Let's call one pole the 'Pole of All Togetherness and Absolute Harmony' and the other the 'Pole of Absolute Chaos and Disharmony'. The poles are implicit. They are just the basic opposing extremes that things can go to. They are abstractions for providing potentials for things to happen. All things unite in perfect coherence at the Pole of Harmony and the opposite happens at the Pole of Chaos. The interesting place will be the absolute centre of the interface between these two contrasts. We would expect the maximum potential difference point here. In my model it will be this point that generates the consequence of the meeting of two absolutes. A Big Bang for instance. It could be expected to generate a stream of them continually. Let's say such as this underlies the whole existential scale and the Big Bang that generated our universe came from such an overall modality. It came as an incidental off shoot of all these logical factors and was a natural implicit expression of them. 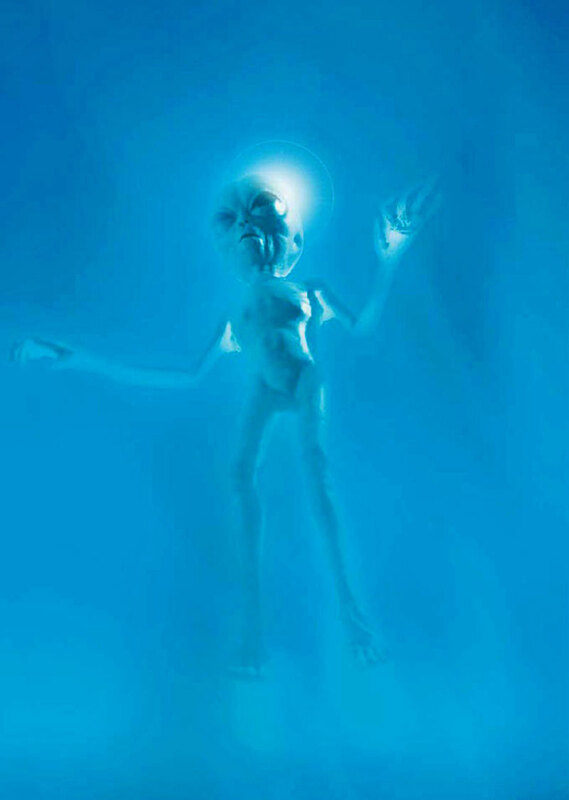 Coming to terms with another life form, or existent mode outside our own human living form, brings us face to face with a huge conundrum about Gods with personas, so with the concept of a Godverse in mind, let's now return to an understanding of the Grey alien phenomenon itself and what that might be. My take on the tall Greys is that they come from planets whose civilization is at the last stage where primary highly intelligent naturally living entities become something catastrophically different: artificial fully functional roboids. In other words, these civilizations have got to the point where the Second Law of Thermodynamics and its corrosive effect profoundly changed these highest natural life forms that they gradually devolved into a machine type being: the tall Greys. This would happen when constant revamping of the natural biological aegis of the living form is intercepted with a continual supplement of implanted devices such that the species is natural no more. The entity has become a synthetic super 'sim-card being' so to speak. I am convinced that the tall Grey is a super sim-card entity still bearing the last dispositions of its version of DNA based life. It converted itself into a 'sim-card cyborg' long ago. From all the reports and evidence available on captured Greys, I believe the taller Grey aliens now have no vestige of their original connection to the Godverse. They are now almost total artificial beings, their bio processes running on soft tissue diodes and transistors. The tall Grey aliens who have 'sim-carded' themselves so to speak into a roboidal state from their previous natural one, now interface well with a mechanically manufactured smaller version made in their image and likeness. Why do they need to travel beyond their own planet and what might this mean existentially to us as natural living human beings? If each natural living individual entity has a personal line of connection tracing back to its origins in the Godverse, therein might lay the answer. This line of connection is what I call a Soul. It is inherently nothing religious. This ancestral line holds the full depository of knowledge, or every single detail of everything and every experience an individual has been through. It holds it as a pattern of forcelessness deployed on a tray of force. In this way a field-grid is created that is everlasting and logs the uniqueness of experiences that hallmarks the individuality of any living thing. The pathway the line takes back to the Godverse depends upon the free choices made by an individual. It runs, I believe, through many lifetimes via the mechanism of the transmigration of implicit states one to the other. We call this the cycle of incarnation/reincarnation, a principle accepted by Hindus and Buddhists and incidentally once accepted by the mystical sides of the Judaic, Christian and Muslim faiths. The tall Greys are a completely artificial intelligence now in their 'sim-card' form because they are almost purely atomic. I do suspect they do have a smattering of DNA and thus a record of their former selves. But not enough to reproduce naturally and have a soul line of connection to the Godverse. In other words they may be trying to steal our souls. Why would they not declare their presence here openly and lead us to 'a glorious future of beneficence and happiness'? Why do they hide from us so blatantly? What then can explain the remarkable capacities of their craft to morph, change direction and travel at speeds faster than light? If the expansion of space had overwhelmed the pull of gravity in the newborn universe, stars, galaxies and humans would never have been able to form. If, on the other hand, gravity had been much stronger, stars and galaxies might have formed, but they would have quickly collapsed in on themselves and each other. Our cosmic history could have been over by now. "We can make measurements that determine its size, but we have no idea where this value comes from," says John Barrow of the University of Cambridge. "We have never explained any basic constant of nature." The immense amount of gravity in a black hole is comparable to the tension in elastic that has been stretched out as far as it can go. Elastic can only be pulled so far, before it unavoidably springs back, thus it is ultimately dominated by the still point to which it is tied. This is an analogy of the dominance of the Godverse over the universe where Godhead is the still point. Thus, gravity is the antidote to the Second Law of Thermodynamics that drives the universe into parts through a web of chaotic disbursement with time. I believe that gravity, the pull back to the Godverse created by the potential difference of the presence of the Godverse in the universe, is the Greys' momentum and inertial moment. It provides their mechanism of changing location. The direction of the gravitational momentum pulling things together could be said to be the highway towards the Godverse. But the expression of the momentum of the universe as it separates parts, through the Second Law of Thermodynamics, is one of force, away from the Godverse. They are 'spiritually' more primitive than us in terms of their intrinsic enforced state, but their direction of travel is towards the Godverse. It has been reported that the various craft the Greys move through space/time run to anti-gravity devices. As they are travelling in an existential modality or reality that is set in the opposite direction to us, their gravity becomes anti-gravity in our reality frame. Their ability to levitate abductees is a property of this phenomenon of anti-gravity. Their craft appear to change shape and direction dramatically because they are travelling on anti-gravitational forces that marry into our various pro-gravitational and nongravitational forces such as magnetic fields. These magnetic forces change all the time. Could the struggle to cope with these constant changes in the force paradigms they have to face in our reality explain why their craft sometimes crash? Gravity is a constant, even force. Electromagnetic fields are not. The mixture of the two, in so many myriad ways, in any given physical universal place may be a big problem for them when they are in the locality of planets and solar systems and not in deep space, where smooth non-variant travel perspectives prevail. Perhaps that is why they sometimes run out of control. The latter views them as beings from another dimensional state and the former as beings from another actual location within our own dimensional state, beings from another planet. I believe both of these hypotheses may well be true. They do exist in another frame of tension that exists parallel to our own state but they can pass from their state to ours and become physically trapped, caught, in our reality. 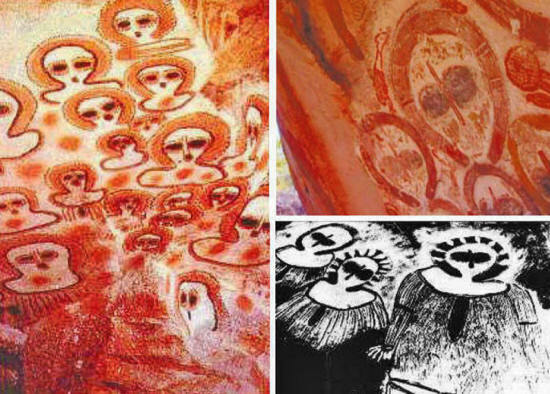 Timothy Good and other respected and reliable sources suggest that there are underground bases all over the Earth containing these craft and occupants that are caught here. They have been seen behind the Moon or near Mars. I believe that these craft are actual physical mechanisms for conveyance in our space/time created for the short utilitarian Greys who actually pilot them. 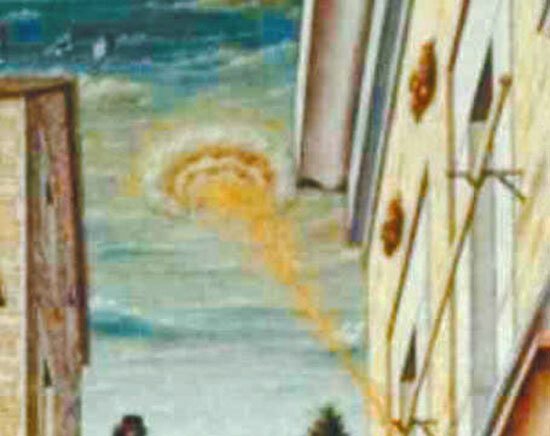 I believe any previous civilizations on this planet such as perhaps Atlantis, Lemuria or ancient India at the time of the Vimana, may have reached the same threshold and inadvertently allowed in the Greys to help convert their species into a physically immortal race through a hybridization program similar to that described by so many abductees today. the two are incompatible owing to the Second Law of Thermodynamics. The very power that makes for immortality, a soul line of connection to the Godverse, is compromised and lessened when it is mixed in with artificial elements. Thus the Greys are doomed to failure, hence the very sickly looking hybrid babies that are often seen on their craft. After these ancient civilizations were destroyed, the Greys may well have been caught here looking for new sources of DNA. They may then have started a program of genetic interception that helped to mould our species into its current form. There is much speculation about the many different types of alien species that are witnessed. I believe these varieties, be they reptilian, insectoid, or amphibious, are products of their contact with other species on planets like ours. These are hybrids that they made which inevitably broke down to express the devolved animal form of the original species. The biggest irony is the Greys do not realize that they cannot, with physical means, get a handle on something that's not physical like the soul, simply because they only understand the physical. So the tragedy lies in the damage they do in trying to reach what they can't reach. Converting us, via abduction and genetic manipulation, to be more like them, making us, in other words, more like machines. The Greys can only abide within the atomic realm with the loss of their original attachment to the eternal existential properties beyond atoms in the Pole of Harmony. They can go no further as they are purely physical creations now. They cannot die in the sense we do and thus naturally reach the gate to the Godverse through the center points of the space between atoms. With the same drive for physical immortality that drives the technological vanguard of our species now on our planet, they seek for their information, their program, to continue. They seek to re-create the biologically natural being they once were, manipulating our genetic prospectus to reflect their own original pro-forma. That way they retain their intellectual superiority and their connection with a potential eternal prospectus of existence albeit on a hijacked soul or connecting line. But, and this is the rub, they will never be able to do it. The soul-field is a unique fingerprint. Entry to the Godverse is only marked for the original natural owner because every bit of information on it is framed with the original's experience and only the original bearer can know the experience that brought it out of the Godverse. An add-on can never be aware of that experience and follow the track back. It would be a wasted effort but the Greys can never know it as such from their point of view as they have lost their own individual track and have become artificial 'sim-carded' entities. The battle lines of existentiality between the artificial and natural were drawn billions of years ago with the Big Bang. We sit on its contemporary stance right now. What is natural is programmed for ultimate eternal endurance. It is up to us as the pinnacle species of natural endeavor here in our 'neck of the woods' in space/time, to see the truth of it all and make the choices that maintain this stance. The prospect of being 'Sim-card Man' beckons us all. The Greys are its vanguard and its alma mater. Will we as a species elect to sing their song and not ours, thereby losing forever the essence of the potential magnificence we truly are...?